There has a been a long-standing debate on the compatibility of EU competition law with fundamental rights protection, particularly as the latter is enshrined in the due process requirements of the European Convention on Human Rights (ECHR). 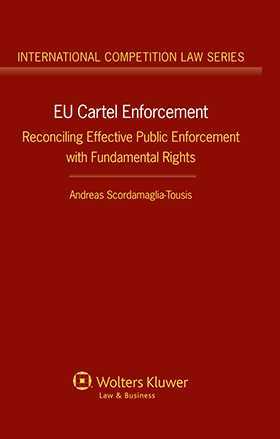 This book, a signal contribution to that debate, assesses two questions of paramount concern: first, whether the current level of fundamental rights protection in cartel enforcement falls within the accepted ECHR standards; and second, how the often conflicting objectives of effectiveness and adequate protection of fundamental rights could optimally be achieved. Following a detailed survey of relevant EU institutional, substantive, and procedural law rules, the author offers a set of persuasive normative responses to both questions. The author’s extraordinarily thorough presentation is rounded off with a remarkably comprehensive bibliography that lists (in addition to books and articles) newspaper articles, EU regulations and directives, soft-law guidelines and “best practices”, EU and ECtHR case law, EU Advocate General opinions, European Commission decisions, and European Ombudsman decisions. General conclusions stress the necessity of introducing further reforms to enhance the effectiveness and legitimacy of fundamental rights in the context of competition proceedings. Few books have taken such a thorough and far-reaching approach to the reconciliation of “effective public enforcement” and “fundamental rights”, or of “effective deterrence” with the principles of legality, non-retroactivity, presumption of innocence, and ne bis in idem. In the depth of its appraisal of the entire spectrum of enforcement components from a fundamental rights perspective, the book is without peers. It will be warmly welcomed by any parties interested in the intersection of competition law and human rights. Chapter 2 Overview of Fundamental Rights Protection in EU Competition Law. Chapter 3 The European Enforcement System and the Due Process Institutional Requirements. Chapter 4 Cartel Investigations and Fundamental Rights. Chapter 5 The Legal Qualification of a Cartel Infringement and Effective Enforcement. Chapter 6 The Rules of Evidence in EU Cartel Proceedings and Fundamental Rights. Chapter 7 The Rules of Attribution of Liability: Reconciling Effective Deterrence with the Presumption of Innocence. Chapter 8 The Rules of Cartel Fining and Fundamental Rights. APPENDIX I EU Courts Judicial Review of Cartel Decisions (01/2001-02/2013) Successful Grounds of Appeal & Fine Reductions. APPENDIX II Degree of Gravity in European Commission Cartel Decisions Applying The 2006 Guidelines.